sadie santana,yasmine deleon,osa lovely, Daisy Ducati and nora peters, nadia jay and misty stone were just some of the celebs spotted at Lure this weekend in Hollywood for Superstar Chanell Heart. Where were you? Follow her on Twitter, book her . Lure is located at 1439 Ivar Ave in Hollywood. Stop by if you are ever in Hollywood. 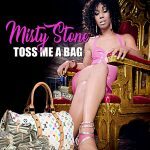 Check out Misty Stone's Hot Single-"Toss Me a Bag"